Joe O'Donoghue makes a point..
San Francisco Building Inspection Commission decided without proper notice and very ambiguous language to meet behind close door to decide the fate of Acting Director Jim Hutchinson who has over 20 years of service working very hard for the Department of Building Inspection. Working even harder for the constituents of San Francisco - even as Jim Hutchinson helped abate and mitigate the AMCO scandal in Hunters Point. This one man fought hard and won one battle at a time. 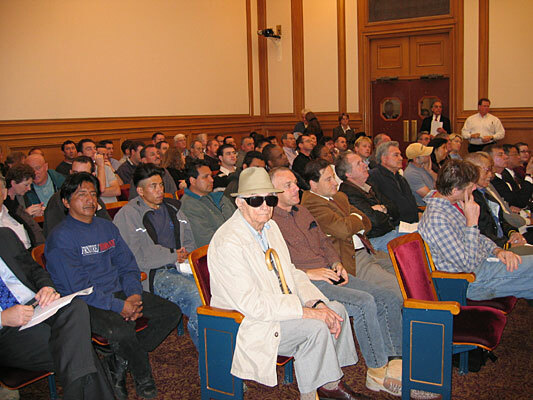 When news reached about the close door machinations - the contractors wanted to expose this shady action - the Residential Builders Association under the able directorship of Joe O'Donoghue outreached to some and invited them to witness the parody before the Building Inspection Commission at 9 a.m. at City Hall in Room 400. In this City and County of San Francisco it has become fashionable to shun sunshine and break laws and regulation that permit the constituents of San Francisco to participate and know what really concerns them. It has become fashionable to make important decisions behind close doors and by failing to give sufficient notice. It is not right to give notice and use ambiguous notice to confuse the constituents of San Francisco. This is what exactly happened today - April 4, 2005 in Room 400 at San Francisco City Hall. Over 25 speakers spoke in favor of Jim Hutchinson and only one-man voiced some comments that were negative. It was very enlightening to hear so many people - speak from the heart and voice their support to keep Jim Hutchinson who came up through the ranks - to best serve the constituents of San Francisco. The Public Comment took some hours and then the Commissioner went behind close door to decide the fate of Jim Hutchinson. After some 45 minutes it was decided to continue the matter for two weeks. This matter will be brought back before the Building Inspection Commission. The next time around the fire works will be well organized and the world will know that those that stand for the TRUTH - will win. The building contractors will not tolerate the destruction of the Building Inspection Department by allowing good people to be fired and demoted. The Building Inspection Department is the only department that is working - especially since the Planning Department is a cesspool. Before 1994 unqualified inspectors decided which buildings were given permits - corruption was rampant. In 1994 the Building Inspection Department was formed and with people like Jim Hutchinson the Department became a model for the Nation. Many permits can be got in 24 hours and still many within 72 hours. Today, politicians want to destroy what is working and good. Today, politicians want to divide the community. Today - instead of promoting and honoring Jim Hutchinson - dirty politics - behind close doors want to demote a good man and make a mockery of a Department that is working. This is a crying shame. 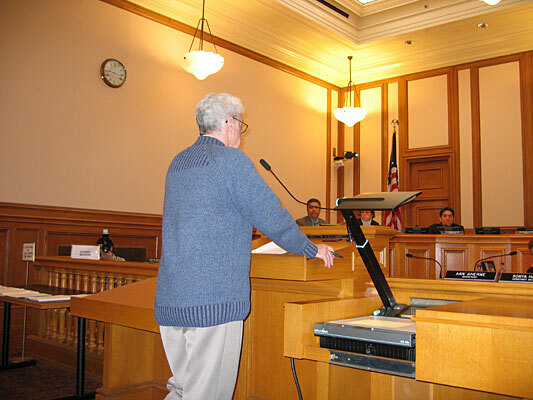 Today - under the leadership of Joe O'Donoghue - Democracy the corner stone of freedom exposed the crooks not to take chances with better minds and proven leadership rampant in the community of San Francisco and especially among the building contractors. In future we will be watching the Building Inspection Commission and other Commissions very closely. We the people demand - sunshine. After all we all are living in the United States of America.